Bipartite: components A and B (with some exceptions like TYLCV, ToLCV and AYVV which are monopartite), circular, ssDNA genome (+) of about 2.6 kb per component (5.2 kb in total). 3' terminus has no poly(A) tract. There are coding regions in both the virion (positive) and complementary (negative) sense strands. The genome is replicated through double-stranded intermediates. The replication (Rep) protein initiates and terminates rolling circle replication, the host DNA polymerase being used for DNA replication itself. There is a potential stem-loop structure in the intergenic region that includes a conserved nonanucleotide sequence (TAATATTAC) where ssDNA synthesis is initiated. Component B is dependent on A for replication. 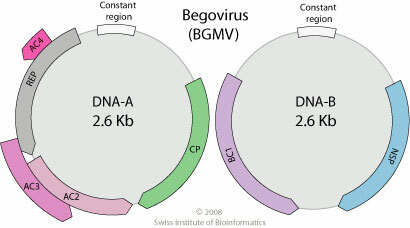 The A and B components each have a common region (CR), which consists of a block of approximately 200bp within the IR and corresponds to the non-coding region common for topocu- and begomoviruses. The common region also contains two divergent promoters which differentially regulate the temporal expression of the viral genes. Transcription is bidirectional from the common region (CR). Proteins are expressed from subgenomic RNAs (sgRNAs). Leaky scanning is probably used for the expression of some of the overlapping proteins. In bipartite begomoviruses, the A component encodes five or six proteins. On the v-sense: the CP. On the c-sense: Rep, a transcriptional activator (TrAP/AL2), a replication enhancer (REn), AC4, and, in some strains an optional protein AV2. The B component encodes two proteins involved in movement. BC1 on the c-sense and BV1 on the v-sense. Monopartite begomoviruses encode six proteins: Rep, TrAP, CP, REn, C4, and V2. Begomovirus protein Rep is responsible for inhibiting host retinoblastoma protein and inducing transition from the G1 to S phase in preparation for virus replication since the virus targets differentiated non-dividing cells. .